MUFF WIGGLER :: View topic - Why no Eurorack piano module? Why no Eurorack piano module? Given the availability of modules like Rings and Plonk, I’m wondering why there isn’t something like a CV-controllable Pianoteq. I can think of a few possible reasons: lack of processing power, lack of perceived interest, etc. Interested to hear opinions on this. My personal opinion, and I realize that maybe not everyone shares it, is that I don't want anything that sounds like a traditional instrument in my modular. The single exception is sample playback and manipulation. That's what pianos are for. Emulating a piano sound would be better via a dedicated keyboard or sample library imo since the sample size needed to store authentic sounding 88 notes with varying articulation / velocity layers would be problematic in a module. For example, Synthogy Ivory is about 49 gigs with 20 velocity layers per key and sounds amazing. This may be overkill for many use cases, but for $189 I’m sure it would be way cheaper than any comparable Eurorack module. Maybe you could put a sample library such as the one mentioned above on an SD card for a Radio Music module. They're pretty cheap. You would need multiple Radio Musics for polyphony though. a192 or a192-2 and Disklavier. 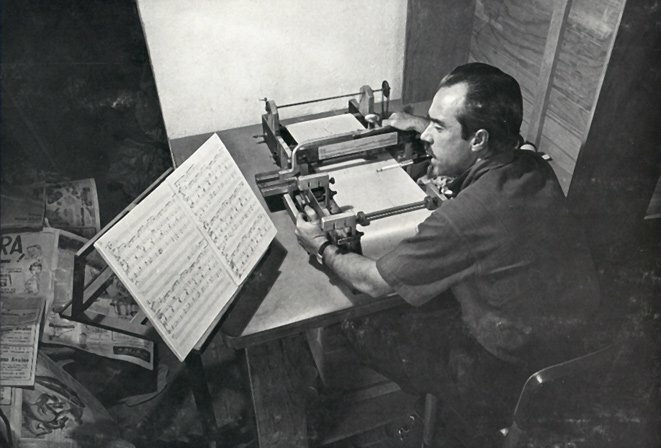 swap the sheet music for sampled white noise, swap the punching machine for the a192 and swap the cigarette holder for a krazy straw going down into some Sujeong Qwa and I'm good. When I started modular I spent many hours trying to emulate real world instruments patching with the modules I had. Not to make them sound real but to use the principle to make interesting sounds that reflect a little of the essence of these instruments. Therefore, with piano I prefer to play directly into the modular and sample rather than try to emulate. The two main reasons are the performance aspect of tinkling the ivories but also polyphony. Agree that a proper sampled piano in Euro is impractical. But, the Korg Z1 had some nice physical models of electric pianos. Not ultra-realistic, but very responsive and tweak-able. I'd love to see something like those in a modular. If there was a semi-decent one, I’d be surprised if they sold a dozen. That’s probably the simplest answer for why there isn’t one. I disagree on the " a one voice Piano would not be interesting" ! Pianoteq seems to work on those mini PC platforms. A 4 voice moduel or so seems doable in regards to CPU questions. I actually don’t have a CV2Midi device to try that suggestion out but the OP (if actually interested in this as a technique and not just curious about module production) could also try in-DAW LFO and sequenced modulators on Pianoteq depending on the DAW (eg Max4Live or Bitwig devices, or Numerology, or Reaktor Blocks) to get a sense for what it would be like. Funny you should mention it. I'm preparing a dedicated piano 6u case, after experimenting with the premise for years. Got a record in mind I've meaning to make; have a few etudes already but I'm not there yet. I would buy a physical modeling piano module in a heart beat. I make do with CV to Midi (a-192-2, ADDAC 222) and physical modeling sounds which I work on my own. Lots of ground to experiment. Just looked at Pianoteq, having not used it before, and now I'm thinking that in module form it could be quite interesting. Forget polyphony, with CV over a range of parameters it would be more like live tweaking a prepared piano...I might be one of the twelve. ...I might be one of the twelve. Honestly, that looks like the start of a great trigger-with-velocity module. How about an alternate firmware for Plonk!!! I would like something like this, which is precisely why I went with a er-301 and more specifically a SSP. There is no shortage of ways to accomplish a module like this with what is already available, and a really good sampled piano is about as good as it gets outside of playing a real one. I am a big fan of my eurorack being able to make any sound.